After what seems like a very long run-up, Apple has finally unveiled its ultra-premium flagship for 2017, the iPhone X - it brings with it a bezel-free screen, some clever AR tricks, wireless charging, intelligent Face ID, and a hefty retail price. But is it the best of the best? As well as the headline specs of the new device, you're probably wanting to know how the iPhone X stacks up against the current competition. Here we'll compare the Apple phone to one of Samsung's excellent 2017 flagships, the Galaxy S8, in all the areas that matter. 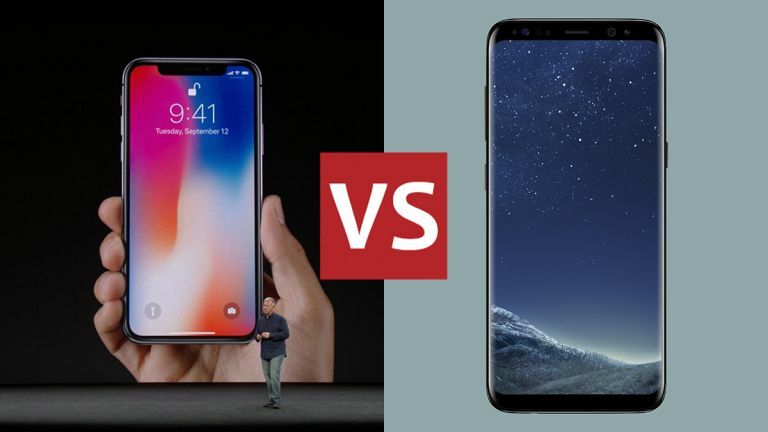 They've both had years to get this right, so you would expect the 2017 phones from Samsung and Apple to look the part, and they certainly do - we can't really separate them on looks, though if we had to pick we'd probably go for the Samsung S8 (above) with its elongated 18.5:9 Infinity Display and slightly curved edges giving it the upper hand. Your mileage may vary. The iPhone X manages to offer a design that melds both classic Apple and more modern touches, with a 5.8-inch OLED edge-to-edge screen and a top notch for a speaker and some sensors, which we're not fully convinced by. It's an all-glass rather than metal design, and physically it's actually smaller than the iPhone 8 Plus. Over in the Samsung corner, we've also got a 5.8-inch AMOLED screen stretched into that 18.5:9 aspect ratio, with a pixel count of 1440 x 2960. Like the iPhone, it's glass all round, though the fingerprint sensor around the back is rather awkward to find on Samsung's phone. As long as you don't glance around the back too often, the Galaxy S8 looks superb. Every year Apple bumps up the power of its iPhones with a brand new in-house mobile CPU, and 2017 is no different, so welcome the six-core, super-fast, A11 Bionic chip. Quite how fast it is won't be clear until we've been able to put the phone through its paces, but based on previous models we'd say this will be a very, very speedy and responsive iPhone. The Samsung Galaxy S8 is no slouch either, packing a Snapdragon 835 or a comparable Exynos 8895 CPU depending on where you are in the world. That's matched with 4GB of RAM, and while Apple hasn't revealed how much RAM the iPhone X (above) is packing, it's rumoured to be 3GB, the same amount fitted inside the iPhone 7 Plus last year. These are two of the most powerful phones around in 2017 so you won't have any complaints from either of them in terms of performance. The Galaxy S8 comes with 64GB of on-board storage, expandable via microSD card, while the iPhone X comes with your choice of 64GB and 256GB. As usual with Apple, there's no microSD card expansion. The vertically aligned, dual-lens camera is one of the key features of the brand new iPhone X, and while we have to take Apple's word for how good it is right now, it certainly looks impressive on paper. Apple says it produces photos and videos that look better than ever, and it's ready for the augmented reality apps coming with ARKit in the iOS 11 update. Over the fence in Samsung land the Galaxy S8 (above) boasts a very capable camera too. It's only a single-lens 12MP snapper, but it has optical image stabilisation, and we can testify that it takes great shots in a variety of conditions. That said, it was only a minor upgrade over the camera in the Galaxy S7, so perhaps this round should be given to Apple. Battery life is about more than the size of the battery - Apple has a very good record for squeezing a lot of efficiency out of its packs - but for the record the Galaxy S8 is fitted with a 3,000mAh battery. The iPhone X Edition battery is likely to be smaller than that (Apple hasn't said specifically) but based on previous models we'd expect it to last at least a day. You've got lots to think about when it comes to comparing the best that Apple and Samsung have got to offer this year, not least whether you prefer the features of iOS 11 or the slightly skinned version of Android that Samsung offers (the S8 is still on Android Nougat). Both are great-looking handsets, and have a lot to recommend them too. Apple has really pushed out all the stops with the iPhone X, and though it's going to cost you a significant amount of cash, you get the best of the best in terms of iPhones. There's the vertical dual-lens camera, the bezel-free design, the smart Face ID system, the wireless charging and more besides. At first glance it looks a substantial if pricey step forward. As good as the Samsung Galaxy S8 is, it feels like Apple has the upper hand in this particular match - though we have yet to really test out the iPhone X, and to be fair Apple released its phone seven months after Samsung. Whichever model you opt for, there's no doubt the benchmarks for smartphones have been raised higher once again in 2017.